Pavonia schimperiana Hochst. ex A.Rich. This taxon is rare and poorly known in South Africa. It is however widespread and common outside South Africa, where it is often a weedy pioneer of disturbed places. It is not suspected to be in danger of extinction. Widespread across tropical Africa, Madagascar and the Mascarene Islands. 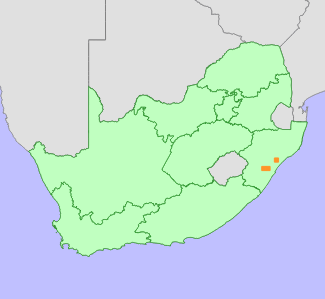 In South Africa it is known from a few collections from KwaZulu-Natal. Woodland, forest margins, secondary scrub and disturbed places. Exell, A.W. 1961. Malvaceae. In: A.W. Exell and H. Wild (eds). Flora Zambesiaca 1 (Part 2):420-511. Crown Agents for Oversea Governments and Administrations, London. Harvey, W.H. 1859. Malvaceae. In: W.H. Harvey and O.W. Sonder (eds). Flora Capensis I (Ranunculaceae-Connaraceae):157-177. Hodges, Smith and Co., Dublin.